I know what you are thinking, why is there another worship album releasing this year, haven’t we had enough of these live albums flooding the Christian worship markets in the past few years? 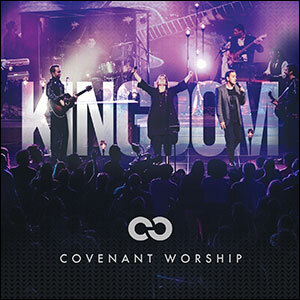 With artists like Hillsong Worship, Jesus Culture, Planetshakers, Bethel Music, Passion, Christ For The Nations, New Life Worship, Gateway Worship, New Hope Oahu, Life Worship and Fellowship Creative, it may seem that this new album from Covenant Worship called Kingdom is something we all have heard before. Well, the truth is that it’s both. It’s the same music, lyrics, and themes that have been explored on all of these aforementioned artists’ albums, yet there is something about the album, despite the obvious shortcomings, something maybe Holy Spirit anointed that draws me into the tracklist overall. Not without its flaws, on the whole this album is enjoyable and ministers to me, so where does the melodies rise and fall? What are the plus points and minus points? Before I launch into a description of all of the songs, let me say that Covenant Worship tries hard. There’s 10/10 for effort. Musically, lyrically and vocally this album is competent, and with 4 vocalists with distinct voices in Joshua Dufrene, David Binion, Colin Edge and Nicole Binion; this is one aspect that I commend them for. Yet the choice of vocalists on each song leaves much to be desired, with the average number of lead vocalists per song being 3 on this record. As there are 13 tracks, on almost all of the songs, all of the vocalists sing, and especially in a live album this can sound mediocre and similar, as there is no track on this album, except for 2 or 3, which highlights a single vocalists’ eloquent and brilliant voice. Though I can recognise all of the vocalists, for me it gets pretty boring if the same vocalists sing song after song, never changing it up. And this is sad, as the songs technically are great and worth listening to. Perhaps my opinion of them will change in the future once I listen more to the tracks. The album opens up with “New Every Morning” which opens like a passionate Hillsong track, complete with ‘woahs’. With simplistic lyrics, electronic and guitar based music, and searing vocals from Joshua and David, this is standard worship and nothing that new. With the theme being that Jesus’ mercies are new every day, and that we can sing out His praises at any time, and He will listen; I found myself ‘tuning out’ slightly, as I have heard this material before in Lacey Sturm’s “Mercy Tree” and Matt Redman’s “Mercy”. Nevertheless, this song is bountiful in tempo and is sure to grab people’s attention from the get go. As I prefer the other artists aforementioned in the introduction more, this song doesn’t really excite me that much. The rest of the songs are a mixed bag. “Risen” and “Can’t Stop Singing” feature Israel Houghton on guest vocals, with the former sounding like a remix-y high octane electric guitar prominent “Today Is The Day” Pt. 2, featuring stellar vocals from Nicole reminding me of Christy Nockels vocally, and thematically singing about how Jesus is risen and all we can do is lift His name higher; and the latter a call-and-response lyrically simple drum and guitars heavy tune about how we can’t stop singing about Jesus’ love, that ‘…forever, you will be more than enough…’. Yet I feel that Israel has sort of put the spotlight on him in these songs, and away from the relatively new worship leaders’. The woahs on these two songs, of which there are plenty; are on my nerves for more than half the song, and though technically these songs are top notch, I just can’t find it within myself to concentrate to them, sorry to say that. “Good To Me”, also lyrically simple and musically busy (this time with synth and keys in a remix like and 80’s reminiscent track), has a repetitious chorus, more woah’s (what else can we expect?) as well as two vocals that sound eerily similar here (although in their solo songs, there is a great difference in the voices! ), that many people may not be able to tell them apart (although the consolation prize is that both Joshua and Colin sound pretty good vocally! ); while “Kingdom Come” boasts many vocalists singing together in harmony, yet though having some sublime and magical moments musically and lyrically, as the song reminds us that we need to bow down to God and worship Him as His kingdom comes here on earth as it is in Heaven, still has borrowed elements from Hillsong, Planetshakers, and Jesus Culture to name a few- this worship anthem is still good, but not great like other worship artists the past few years. With “Your Kingdom Knows No End” sounding like a ‘bad’ Caribbean style worship tune (sorry, but this genre doesn’t feel right to me…) that is also trying too hard to sound like Rend Collective Experiment (is that a banjo or mandolin I hear? ), and the powerful, impacting, compelling but repetitive and too long 10 minute song “More Holy Spirit”, a prayer for the Holy Spirit to rain down and send revival and fire; would have been more impacting, compelling and moving had it been shorter by half (yet is still one of the better and much more thematically focused songs out of the tracks with multiple singers); you might be wondering why I am reviewing this album as high as I am, given how scathing I have been so far. Well what I find to be the gems and shining lights on this record are the songs that have only one singer, as these songs highlight the vocalists a whole lot more, and lets them shine on their own. Nicole Binion leads 2 songs by herself and also sings a duet with Joshua; and these are some of the tracks that I highly recommend that you listen to. “Closer” opens up with an acoustic guitar and soft piano undertones as Joshua and Nicole trade vocals brilliantly and in harmony as they remind us that we want to and long to be ‘…closer, closer to Your heart, close enough to hear Your voice Lord, never let me stray too far, Father hold me in Your arms…’. With such a simple chorus and a sense of cohesiveness and peace not seen on other tracks on this album, I would have to say that “Closer” is quickly becoming one of my favourite songs of 2014, especially when the final chorus is so epically awesome musically with a crescendo worthy of a Dove nomination! “Here Waiting”, a piano only piece that turns into a full band worship anthem (with bits of prophetic and free worship as well!) is just as long as the competent yet dragging out “More Holy Spirit” yet this song doesn’t feel tired nor verbose. Maybe it’s because on this track I can appreciate Nicole’s vocals a bit more, or maybe it’s because Nicole is fervently crying out the verses and chorus with words that are simple to understand yet speak volumes as well; but the chorus of ‘…don’t be far from me, I’m here waiting for You, God I’m not moving…’ and perfect delivery, has me excited and singing along with exuberance as well. The acoustic guitar and keys driven slow tempo ballad “First Loved Me” is the album closer, and Nicole ardently reminds us vividly of the gospel message, also telling us her personal testimony, that ‘…I love You, Jesus…because You first loved me…’. Such truer words have probably never been sung in this album, and as a last song, this tranquil and calm worship anthem is sure to be a fan favourite, of even fans of worship music in general, as they worship Jesus along with Nicole! In between the slower ballads led by Nicole, is the upbeat electric guitar mid tempo southern style rocker “Not Ashamed” led by Joshua. Though I prefer Kristian Stanfill’s song of the same name, this track (which tells the gospel message in another effective way, and also has Joshua channelling his inner Jeremy Riddle); is enjoyable to listen to, as I find more reasons to say that the back half is certainly stronger in every aspect than the first half of songs. Colin also has a solo song (near the front half of the album), with “Let The Name Of Jesus Reign”; and is probably my favourite song from the top six, as Colin eloquently sings in a hymn like fashion across piano, strings, a gospel choir and guitar, about the reasons why we praise Jesus. The end part of the audience joining in with passion singing with Colin, is one of my favourite parts of the album, and showcases’ Colin’s vocals quite well. With the final iTunes bonus track “I Am Loved” being a 10 minute encore of sorts, were the ‘woah’s come in droves, and is essentially a reprise (or a lengthened version of “First Love”); I think that my assessment of Kingdom by Covenant Worship is accurately depicted overall in songs 12 and 13- a good song followed by one which has the potential to improve. Though sporadic at times, as most of the upbeat tracks do not work here; it is the emphatic and spine tingling ballads that move me the most, with Nicole’s songs the most relevant, poignant and inspiring. Though this album can be improve upon, there is still enough here for me to recommend to others, and to keep listening, and I hope that the next album is a bit more unified and less disjointed. Nevertheless, this is a solid effort by David, Nicole, Joshua and Colin. Well done for an album that gives me plenty to talk about!